Considering the varied requirements of our clients, we offer them a highly efficient Sample Filtration Kit. 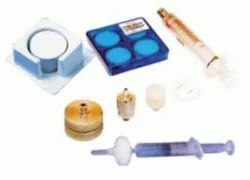 This kit comprises sample filter holder (S.S.), syringe Indian/Imported and Nylon 66 membrane filter of 13mm x 0.2. Our range of Sample Filtration Kit is used for the filtration of sample for HPLC. 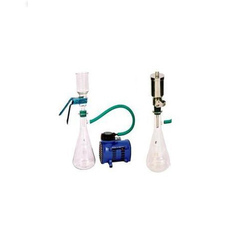 Owing to the wide experience of this domain, we are instrumental in offering Solvent Filtration Kit to our clients. We are leading supplier of Solvent filtration assembly 47 disc filters with Borosilicate Glass. To accommodate the differentiated requirements of our admired customers, we are presenting an exclusive Solvent Filtration Kit.